The rest of our Children’s Advent Lessons (Year C) can be found by clicking this link! Theme/Main Idea: Even when things seem hopeless, God gives us hope. When nothing is left of the tree but the stump, there is still life there… just waiting for the right season to spring up again. “How are you this morning, children? Can I be honest with you about how I am feeling? I am a little sad… disappointed. I was really hoping that I had made a friend the other day at church. We made plans to meet for lunch, but when the day came, she said she had too much going on at work and had to cancel. I had my hopes up, and they just fizzled. So, I am feeling pretty low. Anyone else here ever feel that way? Well, I guess I better get on with the lesson. You want to see what I have for the object lesson today? [let kids respond] Yes? Okay… here we go, I am so excited! Isn’t it beautiful? [kids will likely give you puzzled looks] What? You don’t agree? I think it is beautiful because I just read about what this means in the Bible… In Jeremiah, chapter 33, God promised a branch—or a little seedling—that would grow up and save everyone! Isn’t that amazing? I really like trees, and that must mean this will be an amazing tree! Hmmm… you guys don’t look convinced. Do you suppose this is one of those places in the Bible where it’s like a word picture—and maybe God wasn’t really talking about a branch, a seedling, or a stump? I think that might be right, especially since this passage comes up on our first day of Advent. Do you know about Advent? Advent means “the arrival of an important person or event.” It’s the start of the church year, and throughout the season of Advent we recognize the coming of Jesus as a baby. We celebrate that particular miracle on what day that is coming up? Do you know? [let kids respond] That’s right! Christmas! So, Advent is the time leading up to Christmas. Well, with that in mind, let’s take another look at this promise of a branch that was going to come and save everyone. Do you know what God was actually talking about? Or, maybe I should say… Do you know WHO God was talking about? [kids guess] That’s right… Jesus! Jesus was the branch Jeremiah wrote about. That’s kinda weird, isn’t it? It gets a little less weird if you understand why God promised that branch in the first place. Back then, the people of Israel were pretty discouraged. They had messed up big time, and they were suffering the consequences of some pretty bad choices. They had turned their backs on God and decided to do things their own way. It didn’t work out very well for them. So, like a big beautiful tree getting cut down, all of their amazingness of being God’s people was taken away. They had to leave the places they were living and go live somewhere else. They were sad. They had gone from feeling like a big, important and beautiful tree to a lowly little stump. 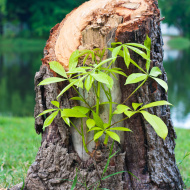 And, as they felt lowly like that stump, without any hope, that’s when God told them that out of that stump they had become a new tree would sprout! At first it would be so small, it would just be like a little branch coming out of the side of the stump! Wow… incredible! When they felt their worst and felt like maybe God would just throw up his hands and be done with them, God gave them a promise. God told them that they would have a future leader, a great great great (you keep going on and on for a little while…) grandson of King David, who would help make them the type of people who are ‘right with God,’ close to him, and part of God’s family! That’s a wonderful promise to look forward to. 14 “The days are coming,” announces the LORD. “At that time I will fulfill my good promise to my people. I made it to the people of Israel and Judah. 15 “Here is what I will do in those days and at that time. I will make a godly Branch grow from David’s royal line. 16 In those days Judah will be saved. Jerusalem will live in safety.